One of the biggest benefits of attending camp is that Maine Camp Experience camps provide kids with the infrastructure to develop independence and maturity. There are many channels that form this support network including the guidance of counselors and senior staff, bonding with camp “big brothers” and “big sisters,” and encouragement from bunkmates and other peers. Maine Camp Experience campers grow by trying new things and learning new skills. They may be prompted or self-motivated to try things they can’t or wouldn’t do at home such as sailing a boat, playing lacrosse, or acting in the camp play. Campers also take enjoyment from learning popular cabin pastimes from each other such as how to make string and bead bracelets, or play new card games during rest hour. And, in the dining hall, campers may be willing to try new foods they see friends eating, which they normally wouldn’t eat at home. Campers also learn to advocate for themselves, follow their schedule, navigate the campus, and to deal with the challenges of group living. At some camps, kids may also decide which activities they want to take. The reason camps are able to help campers so successfully turn challenges and opportunities into independence is because the camps provide a very strong network of support figures who are there to guide as needed. At almost all camps, a camper’s primary support figures will be his or her counselors who are carefully selected and well trained. When camps assign counselors to specific age groups and bunks, they take camper needs and counselor strengths into account in order to create a recipe for success. Younger campers may be assigned a more nurturing counselor, while older campers may be assigned a counselor who is mature enough to relate to them while still retaining their status as an authority figure. These counselors are available at all hours, whether it’s midday or the middle of the night, and campers are always welcome to turn to whichever counselor they feel comfortable talking to, whether this is their bunk counselor or their favorite counselor from activities. Of course, the counselors at Maine Camp Experience camps are not the only ones who will be there for the campers. There is a vast support network beyond the counselors that exists to help the counselors effectively do their jobs, and also to provide additional direct support to campers. At many Maine Camp Experience camps, each age group will have a group leader, which is a senior staff member who is responsible for overseeing the counselors in that age group, as well as helping any particular campers who are dealing with specific challenges. If a camper is really struggling with homesickness, or is having difficulty with friends, these group leaders will do everything in their power to help the child navigate these challenges and have a successful summer. They are constantly in tune with the group dynamics, and try to proactively address any issues. Of course, a counselor does not have to be in a specific “support” role in order to provide support to a camper. Although I am the Landsports director at camp, I will always make sure to sit down with a camper who seems to be troubled or struggling. If a camper is dealing with challenges stemming from athletics – for example, if they have a tough time dealing with losing – I will make sure to have a conversation with them to help them learn to cope with the emotional component of competition. At camp, there is no person who is too important to work with the children – that’s why we’re all here after all. Even camp Directors and Assistant Directors know all the kids by name, and they use their years of experience to work with individual campers to help ensure the most successful summer possible. Every camp has its own methods of supporting campers – however, one trait each Maine Camp Experience camp shares is that they ensure campers are supported for the entirety of their stay at camp. 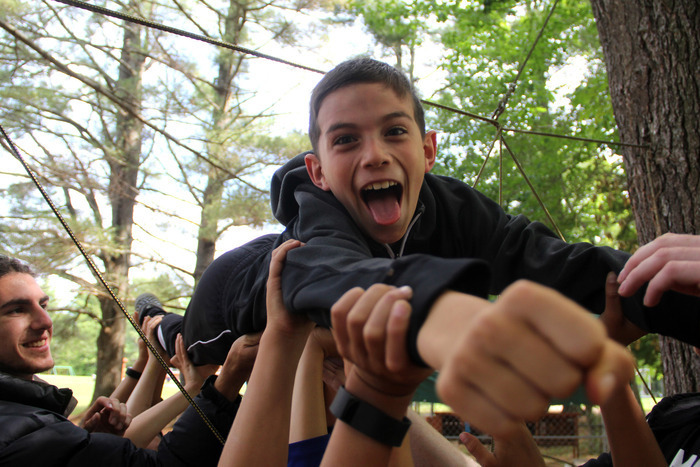 The support networks at Maine Camp Experience camps help campers feel safe and secure as they navigate the successes and challenges of summer, and enable camps to provide parents what they want most: independent, mature, and above all, happy campers.